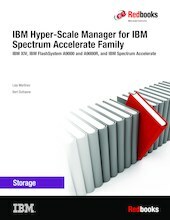 This IBM® Redbooks® publication describes storage management functions and their configuration and use with the IBM Hyper-Scale Manager management graphical user interface (GUI) for IBM XIV® Gen3, IBM FlashSystem® A9000 and A9000R, and IBM Spectrum™ Accelerate software. The web-based GUI provides a revolutionary object-centered interface design that is aimed toward ease of use together with enhanced efficiency for storage administrators. The first chapter describes general features of the GUI and installation of the IBM Hyper-Scale Manager server. Subsequent chapters illustrate some typical GUI actions, among many other possibilities, to manage and configure the storage systems, to define security roles, and to set up multitenancy. For most of the GUI-based actions that are illustrated in this book, the corresponding XIV Storage System command-line interface (XCLI) commands are also shown. This edition applies to IBM Hyper-Scale Manager V5.4. IBM Hyper-Scale Manager based GUI information regarding host attachment and replication is covered in IBM FlashSystem A9000, IBM FlashSystem A9000R, and IBM XIV Storage System: Host Attachment and Interoperability, SG24-8368 and IBM FlashSystem A9000 and A9000R Business Continuity Solutions, REDP-5401. See also IBM HyperSwap and Multi-site HA/DR for IBM FlashSystem A9000 and A9000R, REDP-5434.